attitude (they come away a changed person). This is the story we are to pass down to our children so they can pass it down to their children. To help parents pass down this story of salvation, congregations developed Sunday school programs, youth groups, opportunities for adult Bible study, etc. How can people share this story or parents pass the story down to their children if they do not know or understand it? They are their child’s greatest influence and the cornerstone of a faithful home. In a recent education insert for the LCMS Reporter, a study by the Institute for Religious Education at Concordia University, Nebraska stated that pastors report spending 23% of their time working on the educational ministries of the congregation. The same insert also challenged congregations to focus on lifelong learning and gave a list of the types of practices that “healthy” congregations exhibit (June, 2015). While these are all good things, the question is, if pastors are not trained educators and are not trained regarding education in the seminary, how are they to train the parents? How are they to train their volunteer teachers? This book has been written for two simple reasons, the first being that most Sunday School teachers receive little or no training. It is not that they are not provided a curriculum. It is not that they are unfamiliar with Bible stories. It is that nobody really knows how to equip them. Pastors and other church professionals can be very helpful in providing background information about the Bible, history, or topics to be covered, but how does the volunteer translate that information to the appropriate age level? Sometimes teachers are given opportunities to go through the curriculum and ask questions, but for the most part, volunteers don’t know what they don’t know about educating the age group they teach, so they don’t know what questions to ask. They also often struggle with discipline at different developmental levels. One certainly doesn’t discipline a sixth grader the same way they discipline a first grader. What does one do with a disrespectful seven year old in the middle of a once-a-week lesson? The second reason, and the more serious of the two, is that the purpose of having a building that we call a church is to have a common place to encourage and equip Christians through sacramental worship and Bible study in order that we are strengthened and equipped to bless our families with knowledge of the Bible and the confidence to go out into the world and live and share the Gospel of Jesus Christ. 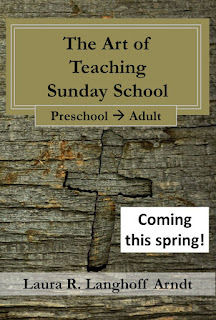 In order for this to happen, we must equip those who teach and lead Bible study at any age. What do they need to know? Is what has been done working for children? Are our current methods of teaching adolescents and adults working? How can we more appropriately prepare those who teach them, including our leaders? What is a good teacher of the faith? The first chapter of this book is about how the brain develops or matures and learns. Without understanding how we learn as we mature, we miss out on opportunities to share in ways that people learn best. After the first chapter the book is broken into five stages of learning or spiritual development: Narrative, Knowledge, Understanding, Reason, and Wisdom. In the Lutheran Church we call spiritual development teaching the faith. We teach people of all ages what the Bible says, and why we believe what we believe. Teaching the faith can begin at any age and can have a profound effect on faith in any number of ways. As teachers of the faith we may have students in a class who have had years of exposure to the Bible and those who have never owned or opened one at any age or in any class. They may have strong faith, but are a little behind in their spiritual development. There is a distinction between spiritual development and faith. As we grow our ability to understand complex issues and themes grows; we find we can understand some of the deeper meanings in the Bible and the complexities of theology (the study of and attempt to understand God). We are able to question and discuss complex and often seemingly contrasting Biblical and theological issues. Our ability to understand, however, is not connected to our faith. Faith is a gift from the Holy Spirit that even newborn babies can have. Ironically, we can have our greatest faith when we are young. Narrative is the stage for children from preschool through second grade. These are the wonderful years when great stories turn into great learning; when they become a part of the child’s world view. Young children become familiar with the Bible by learning its stories and there are a lot of them! It’s not important that they understand everything about them, it’s not important that they can think deeply about them, but it’s important that we lay the groundwork and they become familiar with them. It’s not just God’s story, it’s their story. Knowledge is the stage for children from third through fifth grade. It is the time of learning more detailed Biblical facts of the stories and talking about them, laying the groundwork for advanced study. Children at this age are seeing a bigger, more complex world and have questions. Who are the disciples and what was their purpose? Who is Noah and what can we learn from his story? Where did Paul go on his journeys and what happened to him? They start asking who God is, why Jesus died for us, and who or what the Holy Spirit is. Going over the same stories they learned about when in the narrative stage, students see them as bigger and more complex than they were before and begin to understand more of the details. Understanding is the stage of sixth through eighth grade; the confirmation years. It’s at this stage that we begin to think more analytically. While still important to know, the facts become less important than why things happened. Students think more logically and notice when things don’t make sense to them. Why did God flood the earth? Why were the people so evil? What does it mean to be righteous? Why does God need us to be holy? Couldn’t God just make everything okay? The implications of the stories begin to have much deeper meaning and we want to encourage questions. Students seek to understand the Bible more fully as it taps into how they feel or think about what they know about the Bible and the world. Reason is for ninth through twelfth grades and college students. It builds on the first three stages, using knowledge and understanding to really dig deep and try to see how what we know applies directly to our lives. In high school students begin searching for the truth of life, which is directly related to the scriptures. A lot is going on in their bodies and lives at this time as they begin to become independent. They no longer want to be told what to do, think, or believe. They want to believe it on their own. They are developing reason and judgment and deciding what is true or false. The world and a lot of untruth is at their feet, or more accurately, their fingertips. At this stage allowing them to ask, and answering their questions becomes very important. How do we do that? How do we ask questions that will really get them to think? How do we challenge their faith so that they become comfortable and confident in it? Wisdom is the stage of adulthood. The brain has fully matured, we know the stories, have thought about them and learned from them and have finally reached the point of wisdom. We’re done! Not at all. The truly wise know that where faith is concerned, learning only ends once we are in the presence of the Lord. Only then will we truly understand. Teaching or learning as an adult, however, is different from when we were children or teenagers. It is in this stage that we shift from having to attend Bible study because we are told to by our parents, to wanting to learn. As He draws us to Him, we have a desire to know more and the only way we can do that is to dig deeper into scripture. How do adults learn? What keeps them coming back? Can how we teach affect their desire to learn more? How does one create an atmosphere that piques their interest, challenges their comfort in what they believe, and encourages them to continue coming to learn more? From the stories we’ve heard our whole lives, as an adult they become infinitely more fascinating and interesting. How do we equip and encourage people to teach as if they believe that? These questions are what this book is all about. So, dear teachers of the faith, whether you teach five year olds, teenagers, or adults, this book is what you’ve been hoping for. It will give you confidence that whatever curriculum you have, you can use it to its fullest. It is time to set aside the dry read-a-story-and-paste-paper-together lesson and begin something that will be meaningful to each child at every grade level, from preschool through adult. Curious? Find the book on Amazon this spring.